Hall of Fame Netminder on the move ? Having been activated in late November, Los Angeles Kings goaltender Jonathan Quick is now officially back in the saddle after having been placed on injured reserve in late October, to repair torn meniscus in his knee. His first start in more than a month was Thursday, Nov. 29 in Edmonton. The result was a loss to the Oilers, after giving up a heartbreaking power play goal late in the game. Two games later, Quick was back in fine form as he stopped 34 shots on the way to notching his 50th career shutout, in a rare Sunday night home game against the Carolina Hurricanes. It was his first shutout since March 26, 2018 against the Calgary Flames and extended his NHL record for most shutouts all-time by an American-born goaltender. This season, Quick, wearing number 32 and now 32 years of age, has a record of 1-5-0 with a .889 save percentage and 3.28 goals-against average. During Quick’s absence, the Kings relied heavily on backup goalie Cal Petersen to keep the team afloat. The 24-year old rookie netminder responded by posting a .927 save percentage and a 4-3-0 record through eight games. So impressive was his play, that it may lead to some tough decisions for the Kings’ front office. During his tenure with the team, Quick helped lead the Kings to Stanley Cup championships in 2012 and 2014, but his future in Los Angeles now seems to be a bit hazy. 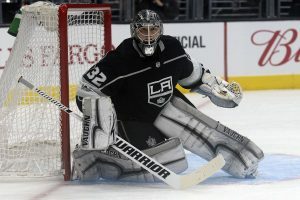 There is speculation that the Kings might be willing to move the future Hall of Fame goaltender, if the season falls apart on them prior to the trading deadline. Quick would be highly attractive trade bait, despite him potentially helping the team turn things around, as he is known to do. He has no problem carrying the team on his back and is one of the fiercest competitors in the league, but of course, he does need some protection in front of the net. As of late, Kings defenders have been somewhat lacking in that aspect of the game. His performance moving forward is a double-edged sword. If he plays well, that is good for the team but also makes him an attractive chip to trade. It seems highly unlikely the Kings would trade Quick but he will attract much interest and a potentially sweet return considering he lacks no-trade protection on his $5.8-million annual cap hit through 2022-23. The Kings seem satisfied with the performance of backup goalies Petersen and Jack Campbell so far this season, so as the trade deadline approaches, we shall see where the chips may fall. * Steven Lieberman is a veteran sports/arts/entertainment journalist. He has covered entertainment and Los Angeles-based pro sports for over 14 years. In addition to covering the NHL, NBA and MLB, he also covers concerts, theatre, opera and other entertainment events. This entry was posted in NHL, Uncategorized and tagged anze kopitar, Cal Peterson, jonathan quick, la kings, NHL. Bookmark the permalink.